One of the other sessions I held at BarCamp Berkshire last weekend was “Intro to Cooking”. This quickly turned more into a “share your cool recipes and kitchen tips”, and I learnt some great things! 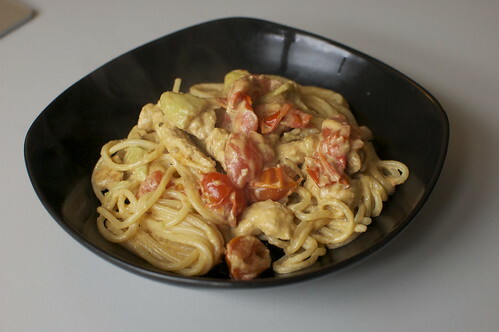 One of the recipes I talked about was Spaghetti Tequila which I made last week after experimenting with some ingredients. Cook the pasta as you normally would. Cut the avocados in squares (if you don’t know how to peel and de-pit an avocado, google it), the cherry tomatoes in halves, and the chicken/turkey in biteable bits. Mix the avocado with the lime juice, coriander and cayenne pepper. Add as much cayenne pepper as you’re comfortable with. If you don’t want it spicy at all, leave the cayenne out. Melt butter in a pan. Add the garlic; once it’s browned, add the chicken. Once the chicken is done (== no pinkish, raw bits), throw in the cherry tomatos and avocado mixture. After a minute or so, once the pan is sizzling again, add the tequila. If you’re not quite sure how much tequila you want, slowly add this in bits, until it tastes as you want. Let it simmer for about 2 minutes, then add the creme fraiche. Let it then simmer for about 3 minutes. Add the pasta and… TADA: Spaghetti Tequila!